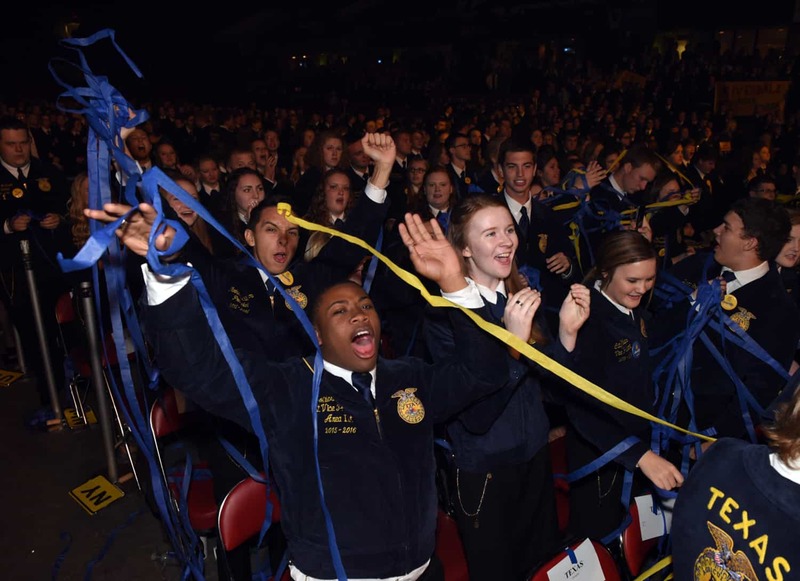 Concert bands have been a fixture at the National FFA Convention since 1947, when the first official band was selected from FFA member tryouts. But that wasn’t the first band to play at the convention. An FFA band from Fredericktown, Ohio, performed in Kansas City at the fifth convention in 1933. 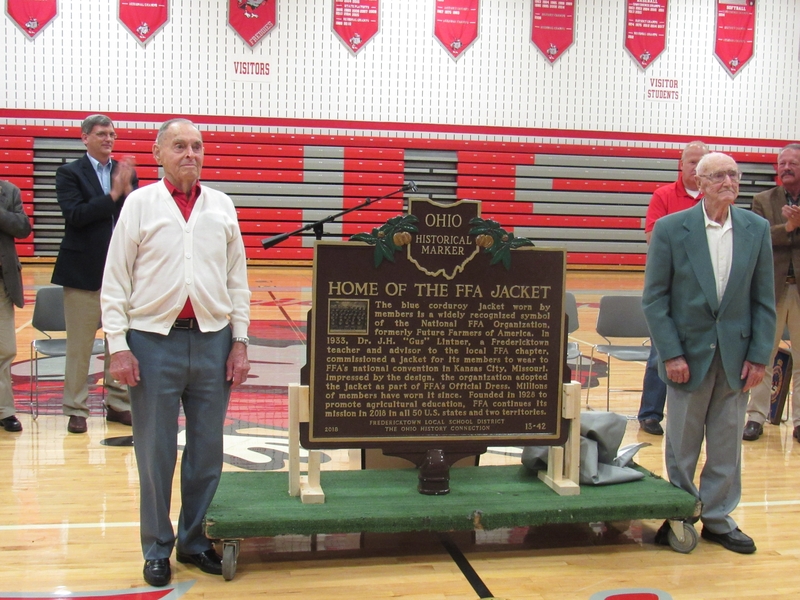 Remarkably, two members of that band are still living – Linden Scheff (pictured above, left) and Neil Overly – and they attended a recent ceremony that recognized Fredericktown as the home of the FFA jacket. Overly, a retired farmer, turned 100 on Nov. 8. 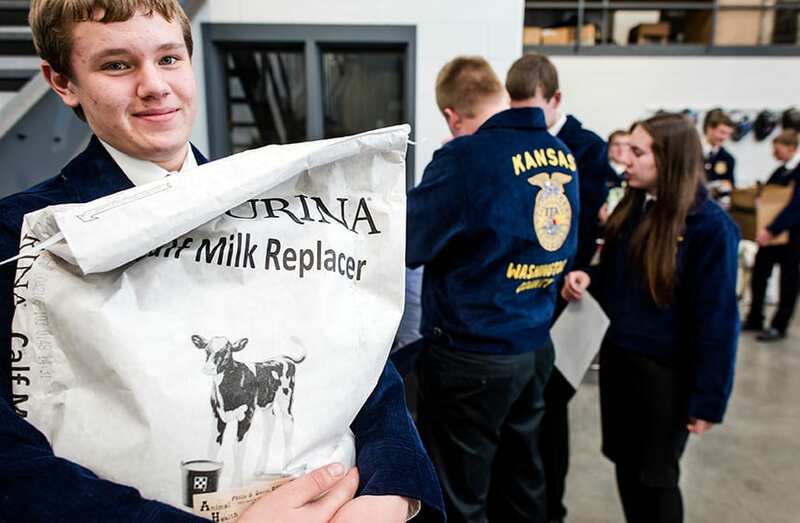 Here, he discusses his FFA experience and the years since. 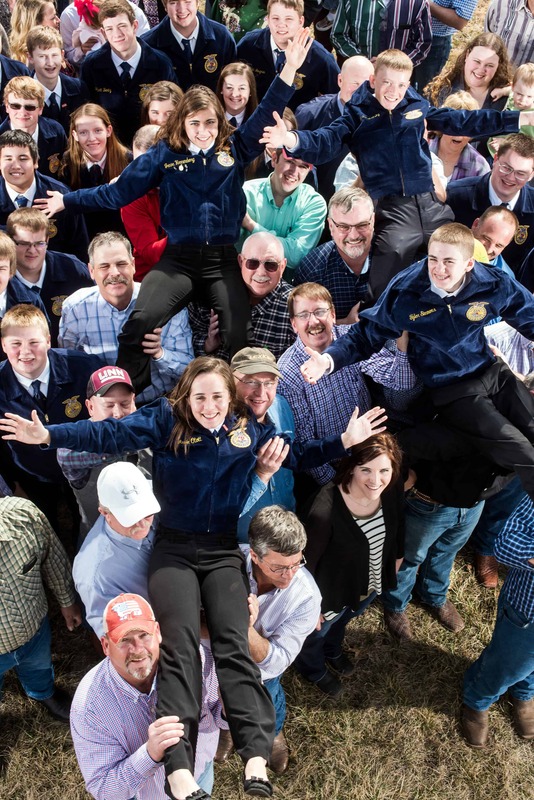 New Horizons: What is the background of that 1933 FFA convention band? Neil Overly: I grew up on the family farm and was a pretty good trumpet player, too. When I was 14 and a freshman in high school, the school FFA leader asked me to join FFA and go with them to Kansas City to play in a band he was taking. We rode the Buckeye Stages bus line and stayed overnight in Indianapolis. I’m pretty sure we played the National Anthem. I don’t remember what else we played. That was also the first year of the blue-and-gold jacket, and I got one. 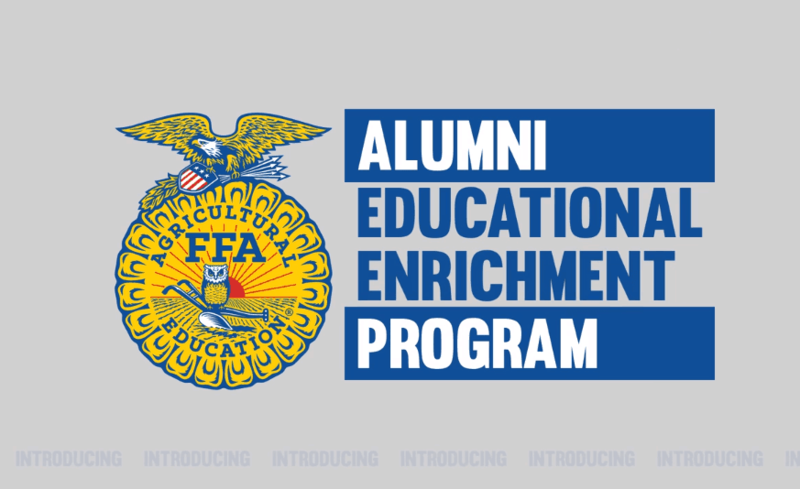 NH: What else do you remember about your FFA experience? NO: I grew an acre of potatoes as my project, using a horse-drawn digger. 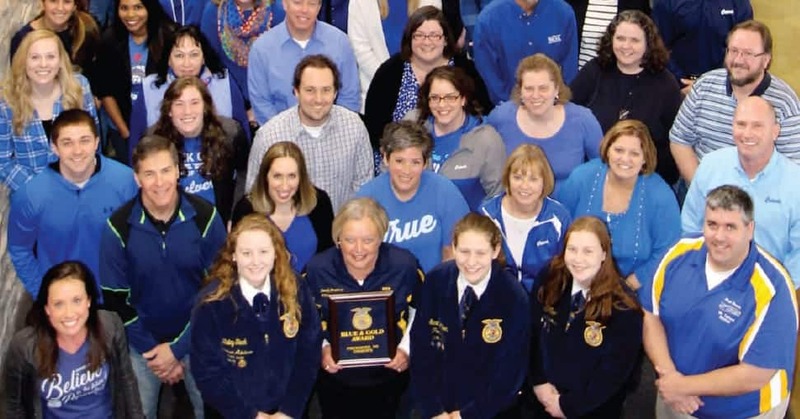 My FFA advisor, Gus Linter, was quite a guy. Along with my dad, he taught me everything I needed to know about farming. 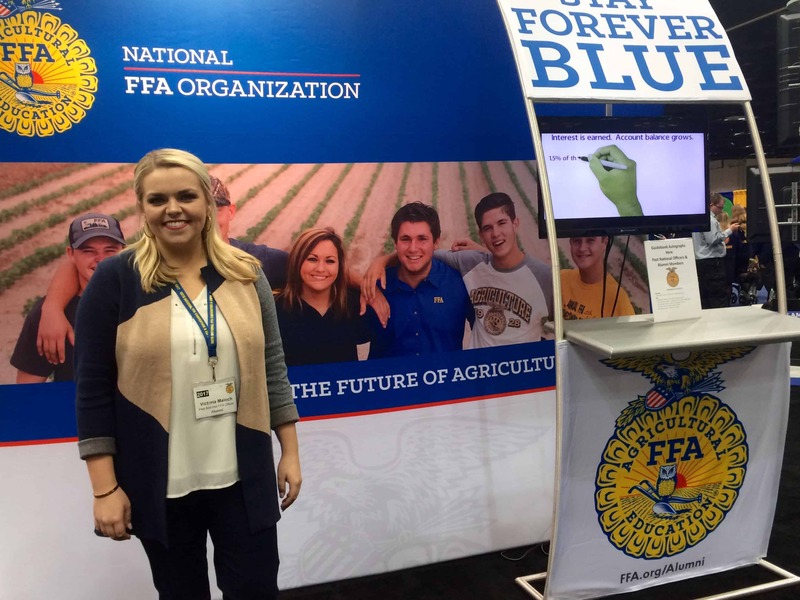 NH: What did you do after high school and FFA? NO: I farmed and played trumpet in a big band for a couple of years. Then World War II came along and the Army called. I served for four years and three months and went across France and Germany as the motor supply sergeant for a headquarters company. I didn’t see any direct combat duty, but I carried a 50-caliber machine gun and will admit that I was scared a few times. NH: And after the war? NO: I married my wife, Vivian, in 1942, before going to Europe. We were together for 73 years until she passed three years ago. I miss her every day. I got my first farm tractor, a John Deere B, after the war. We had dairy cows for about 20 years, then switched to just grain crops. We raised three sons: Cless, Jim and Larry. Larry still farms my land, but it looks like he will be the last generation of Overlys on the farm. NH: Are you still active on the farm? 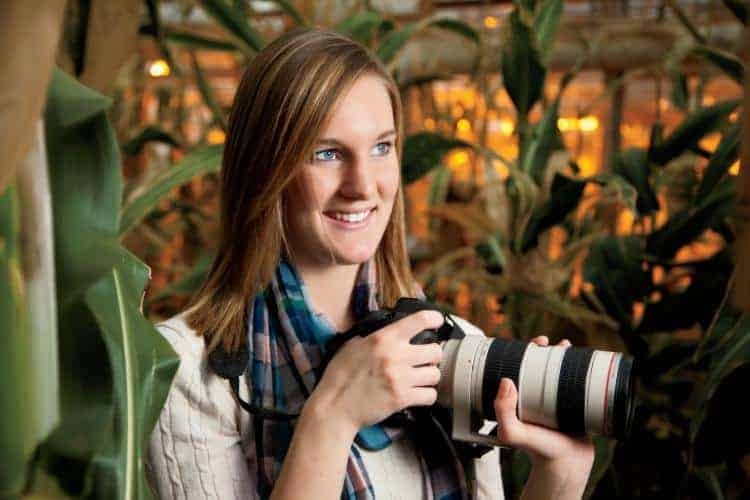 NO: I helped on the farm most days until about three years ago, when my eyesight wouldn’t let me anymore. I still live in the same farmhouse, which was built in 1830. We’ve fixed it up nice. I cook for myself and walk when I can. I had to give up golf when I was 92. I started farming with horses and got my first tractor after the war, a John Deere Model B. The size of today’s farm equipment, with the 12-row corn heads and such, is what most impresses me.